I can’t imagine that Joseph looked like this. What do you think he looked like? What about when he heard the News? Have you ever realized that Joseph doesn’t even have a speaking part in the Bible? In Matthew 1, we see into his dreams and we certainly learn about his character from his actions, but he, himself, is silent. An ordinary, faithful guy, Joseph was just trying to live his life. 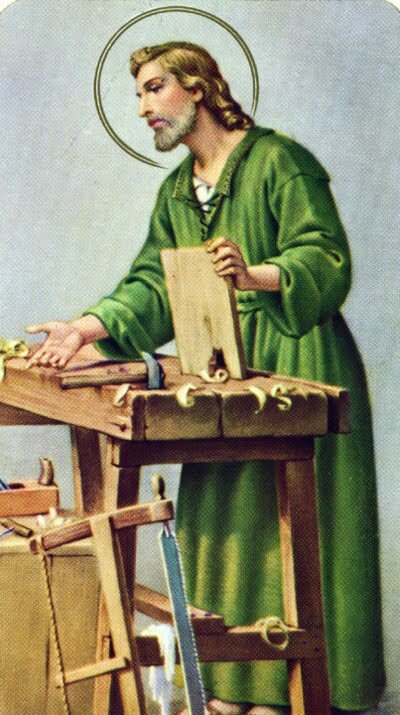 He was a carpenter, engaged to marry. He concerned himself with ‘making eyes’ at his betrothed, with building, with worship, and what he was going to eat that evening. Then suddenly, his world stopped. Mary was pregnant. The baby wasn’t his. After what must have been an agonizing thought process, he decided that he would divorce Mary, to whom he was already legally bound. To us, it may sound cold, but it was the most gracious thing he could think to do. He could (some would argue should) have publicly disgraced her, he could (should) have had her executed- he was well within his rights. By divorcing her, the tables would turn, and he would bring shame on himself. The neighbors would talk, “What has he done to that poor girl? She’s untouchable now- and it’s probably his baby anyway… sad, really. They both have such nice parents!” Joseph was a righteous man, and doing the right thing can have hard consequences. He resigned himself, quietly, to take them all: the stares, the smirks, the whispers and rumors. Exhausted from the stress, he fell asleep and was graced by an Angel, and everything changed. What he had worried over wasn’t going to conclude as he’d expected. And the truth, his new understanding- was it better or worse than what he’d feared? What would it all mean? The one thing he knew (now for sure) was that God had a hand in this situation from the beginning. And so he remained faithful, and held out hope. Joseph married Mary. She had the baby, and his father named him Jesus. Just before this passage, Matthew begins the gospel by presenting the lineage of Jesus, person to person to person… until it comes down, not to Mary, but to Joseph- and there’s a reason for that: by naming this child, according to ancient tradition, Joseph was claiming him. He was acknowledging God’s role in his son’s life, while adopting this boy as his own. Joseph could have ignored the baby from the Holy Spirit, he could have left Mary to go it alone, but instead Joseph shows incredible faith, incredible grace. He stands up and serves as a father to the Son of God. Without one recorded word, Joseph speaks volumes. And because of his witness, we have to ask ourselves, When circumstances throw us for a loop, are we Josephs? Dare we be? Do we look for God in the midst of our troubles? Do we respond righteously, faithfully, obediently? Are we quick to show grace? Living God, may we be more like Joseph: slow to speak but quick to serve. In the name of the Father, and the Son and the Holy Spirit, Amen. 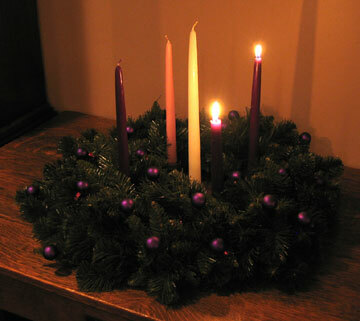 In the madness that can be the Christmas season, we act as though we could lose Jesus. If everything isn’t prepared just right, if the gifts aren’t bought, if the family doesn’t look just right, if the manger isn’t just so…everything will be ruined. Jesus will be lost and it’ll be another year before we can try again to welcome him. My sister’s children have a Playmobil nativity set. It’s provided hours of entertainment over the years. As a family, we’ve enjoyed talking about the shepherds, having the wisemen follow the star, putting Mary and Joseph in just the right position, and making sure the angel went to tell the news. There’s only problem… their Jesus figurine has been gone for at least four years. The year we lost Jesus, everyone tore the house apart- we checked under furniture, in corners, in the Christmas tree, we even looked in the vacuum bag to make sure that he hadn’t been sucked up. That year, I found an old, yellow Lego man at my parent’s house that I thought might serve as a stand-in. I was told pretty quickly by the girls that he was not Jesus. For months after Christmas, we keep up the search. After all, what good is the Christmas story without baby Jesus? Imagine my surprise when the above photo was texted to me last week with the line, “FOUND JESUS!!!!!!! !” As my sister cleaned out her old sofa before donating it to Habitat, she found him. Jesus had fallen deep into the sofa- had survived a move, and for four years, he’d been right there, sitting in the living room- with them all along. In the hustle and bustle of living, even without their knowing it, Playmobil Jesus had been right by their side– in the middle of their home, year in and year out. That plastic Jesus taught me more than I ever thought he could! Jesus Christ, came as one of us, for all of us. He, (yes, like Playmobil Jesus) is in the middle of our homes and the midst of our lives already. Whether we know it or not, he’s with us. Whether things are perfectly ready or not, He’s been born. No matter what our Christmas looks like, we have a God in Jesus who lived and died, and rose again for us. Today we await the One whose coming is certain! This Bible verse gets a lot of play this time of year- and why not? In a season of giving, it speaks of selfless love and reminds us to remember the needs of others over our own. But there is another side of the story, one that doesn’t get nearly the attention: and that is the message of the importance of receiving, graciously receiving that which we are given. Receiving, I think, requires that we make ourselves vulnerable, that we open our hearts to those who would give of themselves to us. For many of us, that’s a tall order, maybe too tall. It is hard. Frankly, it can be threatening to be the recipient. There are a number of reasons: we don’t think ourselves worthy, or we think so highly of ourselves that we want to always be the giver, or we don’t take the time, or we just don’t want to give others that kind of access to our hearts. …But refusing to receive is a double tragedy. First, we deny ourselves that joy of accepting, and reflecting on a gift that someone has taken the time and trouble to give, and second, we deny the giver the joy of giving. There is truth to the scripture that it is more blessed to give than to receive- but, especially during Advent, we must remember that in the miracle of Christmas we were each given the most holy and precious gift of all: a Savior. All we have been asked to do is receive it. Will we? “Then John’s father Zechariah was filled with the Holy Spirit and spoke this prophecy: “Blessed be the Lord God of Israel, for he has looked favorably on his people and redeemed them. He has raised up a mighty savior for us in the house of his servant David, as he spoke through the mouth of his holy prophets from of old, that we would be saved from our enemies and from the hand of all who hate us. Thus he has shown the mercy promised to our ancestors, and has remembered his holy covenant, the oath that he swore to our ancestor Abraham, to grant us that we, being rescued from the hands of our enemies, might serve him without fear, in holiness and righteousness before him all our days. At the circumcision of his son John, Zechariah spoke the above prophesy about what God was doing for the world (the big picture) as well as for his son (the smaller picture). John, later known as the Baptist, indeed cried out to all, pointing to Jesus as messiah. While this prophesy was made for and about John, it can also apply to us. We are all called to give knowledge to the world of salvation in Jesus Christ. Are we brave enough to follow their lead? If you’d like, join us for the 5:30 Children’s Christmas Eve service:you do not have to have children or be a child to attend. 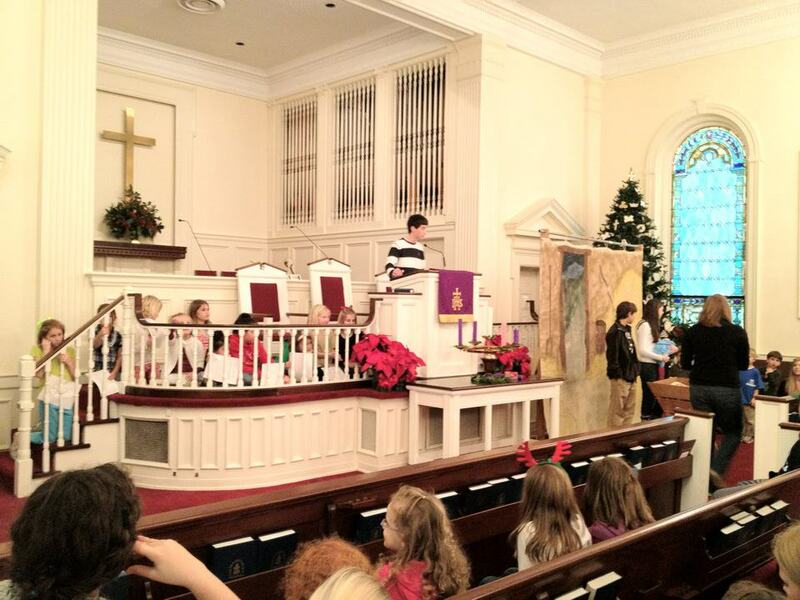 Watch as the kids of FPC help us to return to the manger and the awesome birth of Jesus the Christ. You’re free to return to a totally different service (the fantastic service of candlelight and communion led by adults) at 8:00. Have you ever really considered the details of Christmas? This week in Sunday school my class took time to think about the particulars of the birth of Christ: the sights (of Angels, but also of rats and an Inn with no room), the smells (animals, blood, sweat, frankenscence), the sounds (praises sung, but also the cries of a mother in labor), the feel (of straw and dirt, and the cold touch of gold), the taste (of cool air, of stale bread). …The coming of our King of Kings, of Emmanuel: God with us wasn’t as beautiful as we’d like to imagine it. That said, it was incredible… and we are so thankful. There are 2 weeks until we worship at the feet of our newborn King- are we ready? Stop and Listen! Joy to the World! The Lord is Come! One of my favorite aspects of Advent and Christmas are the lights- from street corners to home windows, to Advent wreaths glowing; from the star shining in the east, to the sparkle of God’s light as we sing our final hymn on Christmas eve. Absolutely incredible! 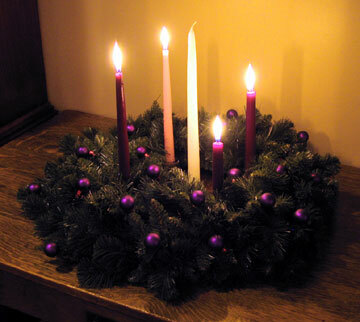 Our homes and churches light up with warmth and an eagerness to celebrate the birth of our Lord. 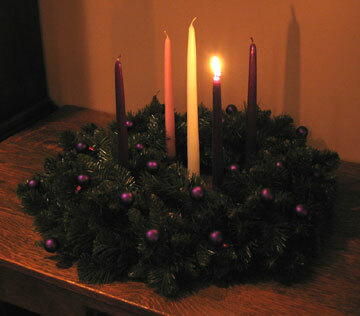 In the glow of candle light and star light, I am reminded that God uses us to bring his light to others. While many of us glow with joy and promise during this season, others of us find that the days are darker than we’d like. It is then that we can remember that even one candle’s flame can often provide light enough. However large our light, it may be all someone else needs to hold onto hope. We are called to let our little lights shine- for we have the light of Christ within us. We shine all we can. We provide light and warmth as we are able, and we accept light from others when we need it to see our way.